Make Your Wedding Day Legendary with Aaron’s Catering of the Palm Beaches! Ragtops Motorcars in West Palm Beach Florida is an institution in Palm Beach County. Many of the most legendary Weddings, Bar and Bat Mitzvahs and corporate events have taken place within the hallowed walls of this landmark. The owner of the property, Ty Houk, has grown the renowned facility from a dream 33 years ago to a museum that houses one of the largest collections of vintage and collectible memorabilia from the 1920’s through the 1960’s. His knowledge, respect within the industry and expertise is known world-wide. Literally 1000’s of vintage automobiles have showed off their glamour in the building as a rite of passage for any true collector. Celebrities and notables alike from Palm Beach to Miami store their vehicles there or leave them to be sold based on the venues first class reputation. The magic begins as your guests enter our unique special events playground filled with automotive memorabilia and an awe inspiring collection of vintage cars. They will be greeted by be bopping “cast members” dressing the part with poodle skirts and Varsity Jackets handing out specialty cocktail consisting of slow gin fizz, champagne cocktail or Tom Collins as they peruse the paraphernalia consisting of Mini Coca-Cola bottles with bendable straws, 1940’s gas pumps, an authentic jukebox, and cigarette signs of yesteryear transporting them to a by-gone era. A 57 Chevy, 1937 Buick Special, The Austin Princess Vanden Plas or a 1934 Plymouth PE Deluxe may be one of the cars you select to show up at your special event. The venue also lends itself beautifully to a Gatsby 1920’s speakeasy theme replete with vintage 1920’s automobiles, Feather boa and pearl necklace centerpieces, Jeroboams of Champagne, tuxedoed serving staff and Flapper “cast-members”. Gorgeous automobiles line the perimeter of the venue, while dramatic pin spots highlight all centerpieces of Huge Toy Jacks or a Mini Jukebox sitting atop specialty linen and highboys. The interior is finished in sea sand with antique black and silver art deco sconces, column palm trees and deco furniture. Our Special events team is unparalleled in their experience, creativity and imagination. From our 5 star Chefs to our award winning event specialists we stop at nothing to ensure that your guests marvel at the total experience from the impeccable décor, the timeline, the food presentation and flavor to the specialty cocktails and flair bartenders. 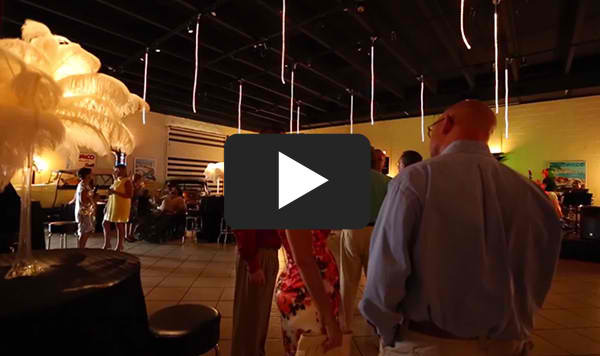 Ragtops Motorcars is truly a one-of-a-kind venue ready to host any type of event. Whether you are planning a corporate party, wedding, private event, bar or bat mitzvah, Ragtops is ready to make your dreams a reality.